Welcome to another edition of Tombstone Tuesday! 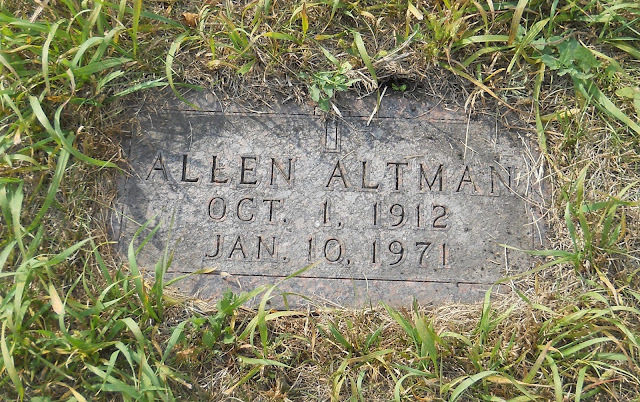 Still making our journey through Anselm Lutheran Cemetery, today’s tombstone belongs to my paternal great-uncle, Allen Willard Altman. Allen Willard Altman was the second of four children of Ludwig Wilhelm Altman and Ida Marie (Krueger) Altman. He had two brothers (one older, one younger) and one sister (also younger). Allen was born 1 October 1912 in Lisbon, Ransom, North Dakota. He died 10 January 1971 in Lisbon, Ransom, North Dakota. He’s buried in Anselm Lutheran Cemetery in Anselm, Ransom, North Dakota. The cemetery borders what used to be family farmland.